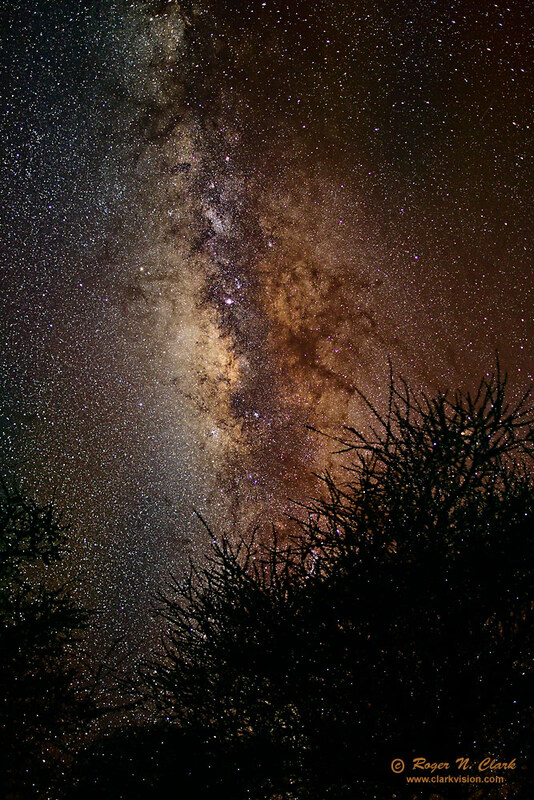 The Milky Way imaged from one of the darkest skies on Earth: in Tarangire National Park, Tanzania, east Africa. I was at a tented camp and made this image with male lions roaring nearby (about 1/2 km away). One shouldn't be out alone, especially with no lights on in such an environment, so I made several 10 second untracked exposures and three 30 second tracked exposures. I dared not trek too far from camp for a better foreground, so these acacia tree branches at the bottom of the frame had to do. Later that night, a male lion came less than 100 meters from the tent and made several loud roars. Elan's ran by the tent to get away from the lion. Technical. Canon 1D Mark IV digital camera, 24 mm f/1.4 II L lens at f/2, ISO 1600. A single 30 second exposure tracked using a home-made hand cranked 1.2-pound barn door mount. With setup and polar alignment, I was out for about 30 minutes. Full image, no crop. Without the tracking device, stars will show trailing after about 10 seconds of exposure with this camera and lens. This image could be produced by adding three 10-second exposures together.